Cheapest Coach Travel From £1.00 Across The UK. Get Your Ticket Here. 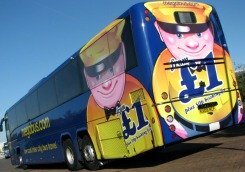 Buy your Megabus ticket from £1.00 (and 50 booking fee) only and travel in style across over a 100 destinations in the UK. From London to Manchester, Leeds, York, Birmingham, Scotland and to many European countries! Megabus Tickets? Click Here To Buy Now! Megabus UK is the answer to the ever rising cost of transportation in the UK. With tickets from £1 to most destinations in the UK, you can travel to most places on a shoestring budget: no wonder it is so popular with students across the country. You can buy your Megabus ticket here in good time and save money on coach travel in the UK. The availability of this no-frills bus services is fantastic. A few routes on the network are covered by the Mega Train services, another Stagecoach ultra low train service. The bus runs, for example, five daily services from London Victoria Coach Station to The Priory Queensway Stop PC in Birmingham with fare ranging from £1 to £9 depending on how soon you book your tickets... and the whole journey lasting about 2 hours 45 minutes. Where do you plan to travel to? London to Manchester on Megabus? Megabus UK leaves from the London Victoria station mostly. If you are travelling from London to Shudehill Interchange Manchester for example, you have an option of up to eight (8) journeys from London Victoria Coach Station to Manchester and if you book in advance, say up to 6 weeks earlier, you pay only £1.00 plus 50p booking fee. Where ever you are travelling to, you get a luggage allowance of up to 20Kg per person, and no other hidden charges. Save money and travel on this no-frill long distance bus in style across the UK. Despite in coach toilet facilities, you can have travel stops on long distance destinations. Megabus UK carries about 2 million passengers annually in the UK now, to over 300 destinations across the country. The network cover stretches from the idyllic Highlands of Scotland to the vibrant South-West of England, connecting some of the UK’s most scenic and popular destinations, including London, Birmingham, Manchester, Liverpool, Leeds, Edinburgh, Glasgow, Cardiff and more. This list is by no means exhaustive. There are many many other destinations other than through the London routes, but since London is the most popular city in the UK, you can see why those routes are most popular. That means that if there is a place you are planning to travel to and wonder if it is covered, it is most likely covered. Why not Enter Your Destination Here, see if it is included in the network and book your cheap coach journey! 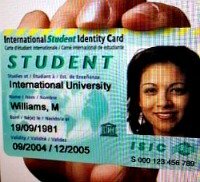 Get Students' Discount On The "Mega Coach"
If you are UK student and have a valid NUS Extra card (National Union of Student Card - which you can register for and buy here online from the NUS Extra Card site), you can save even more buy getting another 10% off the cost of your journey! You can also register with Megabus and look out for their free offer of up to 10,000 free seats dished out to passengers - you don't have to be a student to get these free seats offers, from time to time. Planing to visit London from the North, Scotland or Midlands in the coming months? What ever brings you to London - work or play or the love of nature and great history; visit the natural History Museum with one of the largest and most diverse collections in the world or see everything else London could offer on the "big bus or Megatrain from £1.00! Have you travelled on the Megabus before? Are you intending to try out this no-frills bus service and have a question or comment? Or you just have a great story about Mega Coach? Share it! Help improve services on this great resource for budget travelling across the UK.